These athletes couldn't live up to expectations in Beijing. 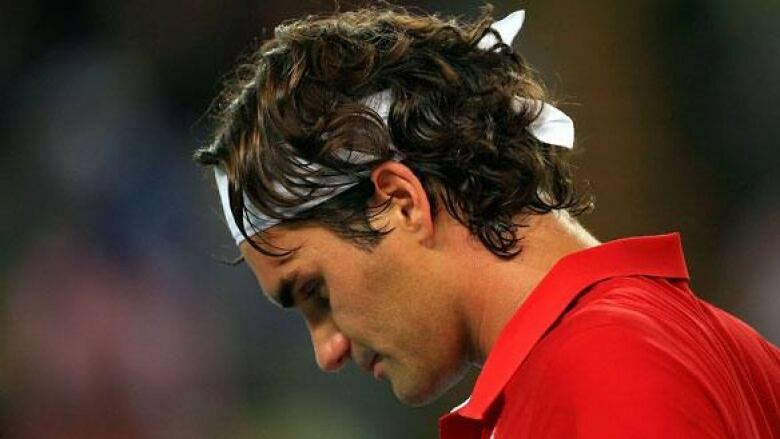 Roger Federer's quarter-final loss in Beijing confirmed his fall from the top of the tennis world. ((Jamie Squire/Getty Images))For every yin, there is a yang. And for every thrill of victory, there is an agony of defeat. While plenty of athletes surprised us with their ability to seize the Olympic moment, others stunned us by failing to rise to the occasion. Roger Federer: Swiss miss The 12-time Grand Slam champion landed in Beijing as the world's No. 1 tennis player in name only, having ceded the people's championship to Spain's Rafael Nadal in July's classic five-set Wimbledon final. The Olympics confirmed the fall of the Federer empire. Looking like a shell of the man who dominated his sport over the last four years, Switzerland's flag bearer fell in the quarter-finals to chronic underachiever James Blake of the U.S. Nadal went on to win gold, and days after the Olympics the new world rankings confirmed what everyone already knew: Nadal is No. 1. Adam van Koeverden: Choke on the water No Canadian seemed a safer bet for an Olympic medal than the buff kayaker from Oakville, Ont. Indeed, that perception helped van Koeverden land the job of carrying the Maple Leaf at the opening ceremony in Beijing. But on Day 14, in the first of his two finals, van Koeverden sputtered to a stunning eighth-place finish in the 1,000 metres, an event in which he was expected to contend for gold. The Canadian rebounded from the puzzling performance ("I just didn't have it," he told CBC Sports) to salvage a silver in the 500, a race he was favoured to win. 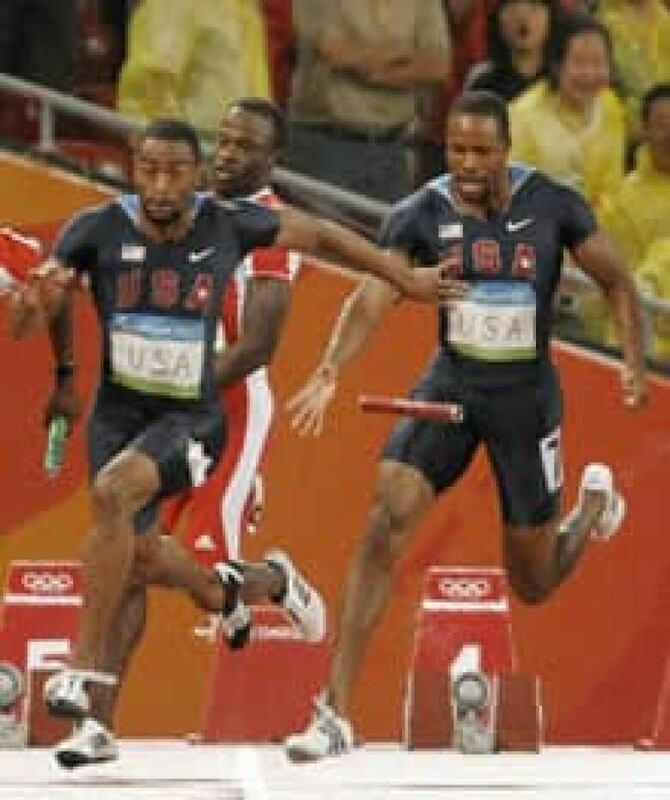 U.S. 100-metre relay teams:Lost in transition Among the favourites for a medal, the American 4x100-metre relay team crashed out in the semifinals when Darvis Patton and Tyson Gay dropped the baton, keeping the U.S. men out of the Olympic final for the first time since 1912. Incredibly, the same fate befell the star-studded women's squad less than an hour later when Torri Edwards and Lauryn Williams botched their exchange, keeping the American women out of the Olympic relay final for the first time in 60 years. Javier Gomez: Paper Tiger Dubbed "the Tiger Woods of triathlon" by Canadian rival Simon Whitfield, Gomez arrived in Beijing as the unquestioned master of his sport. An Olympic gold seemed a foregone conclusion for the reigning world champion and two-time reigning World Cup winner from Spain. But sweltering temperatures and a determined set of opponents conspired to tame the Tiger. Germany's Jan Frodeno outsprinted Whitfield for the gold medal and Bevan Docherty of New Zealand took the bronze, leaving Gomez one spot off the podium. Alain Bernard: Dropped anchor All eyes at the Water Cube were on Michael Phelps's quest to win an unprecedented eight gold medals. But France's 4x100-metre freestyle relay team had other plans, with Bernard predicting before the race that his boys would "smash" Phelps and the Americans. The French looked like they'd deliver on Bernard's boast as their anchor held the lead on the final half-length. But little-known Jason Lezak roared from behind to beat Bernard to the wall by 8-100ths of a second, giving Phelps the second of his record-setting eight titles in Beijing. Marie-Hélène Prémont: Last gasp? The World Cup standings leader, Prémont had reached the podium in all seven of her mountain bike races this season, boosting hopes of a gold medal in Beijing. But her Olympics took a shocking turn when she began hyperventilating on the second lap of the women's event. Unable to regain control of her breathing, the 30-year-old from Château-Richer, Que., bowed out of what might be her final Olympic race. "It's the worst thing that could happen, having to stop at the Olympics," she said. "I've never stopped any race since I began. Even when I fell or broke something, I always finish. Shanaze Reade: Crash and burn With a trophy case that included the last two BMX world championships, the brash Briton was heavily favoured to add the first-ever Olympic gold to her collection. But there's no such thing as a sure thing in this frenetic sport. Deciding a silver medal just wouldn't do, Reade made a bold move to pass leader Ann-Caroline Chausson on the final bend. The Frenchwoman shook off the ensuing collision and cruised to the gold medal, while Reade wound up with a faceful of dirt, a badly sprained wrist, and a DNF. Liu Xiang: Unbearable pain Along with Yao Ming, Liu Xiang was touted as the face of the Beijing Games. But while few expected much from Yao and the still-developing Chinese basketball team, Liu was seen as his country's great hope for track glory as he defended his Olympic title in the 110-metre hurdles. The devastation, then, could hardly be understated when Liu pulled out of his opening heat because of a painful foot injury. Speculation had swirled for weeks that the star athlete was hurting, but no one knew how much until, after an opponent false-started, he peeled off his race number and walked out of a tunnel at National Stadium as millions of Chinese looked on in shock. "I wanted to hang on," a disconsolate Liu said in a TV interview the next day. "But I couldn't. It was unbearable." Fabian Hambuchen: Lower in the bar Considered a threat to win multiple gymnastics medals in Beijing after debuting as a 16-year-old in 2004 in Athens, the German instead managed just a single bronze. That came in the horizontal bar, the event Hambuchen won gold in at the 2007 world championships. He also finished seventh in the Olympic all-around competition despite being the world silver medallist. Roman Sebrle: Fall of Roman Named the world's finest athlete by a panel convened pre-Olympics by the Wall Street Journal, the reigning decathlon gold medallist faded to sixth place in Beijing. At least the news wasn't all bad for the 2007 world champion Czech, who had battled injuries in the spring: good pal Bryan Clay of the U.S. led wire-to-wire to win gold, and did so without breaking Sebrle's world or Olympic records.